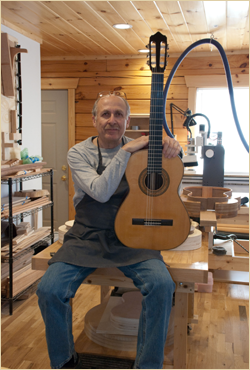 Chuck Marfione, builder of hand-made concert Classical Guitars and 18th and 19th Century reproductions, is incorporating his love of a tactile craft with the precision and efficiency a CNC machine provides. Marfione is a luthier, a master of making string instruments. One of his projects is the Concert Classical guitar, modeled after the 1912 Ramirez owned by Segovia. Marfione says, "Probably my greatest challenge is balancing my desire to maintain all of the wonderful traditions of this instrument, while taking advantage of all that is available today in terms of materials and technologies, which can potentially improve its performance." In his process to build well-crafted detailed guitars that deliver a great sound, Marfione incorporates into his instruments what he feels are the best design elements from the history of classical guitars. He recently purchased a CNC machine for the precision and the repetitive parts of the guitar making. The modest Marfione says he stepped into this hi-tech world with absolutely no knowledge of CAD/CAM or CNC technology. "Going down this path presents some conflicts and challenges. One of the attractions to lutherie for me is being able to work with my hands; that tactile feeling of being in touch with the materials." Marfione finds the need to be able to work precisely and consistently with his hands is often diametrically opposed to the concept of working quickly. That is where the CNC technology becomes appropriate. "Some of the first projects I worked on were jigs and fixtures, as it made sense to get some of those out of the way. One of the projects was making my own sanding disks. It was fairly easy to model the dish in Rhino, create the G-Code in RhinoCAM, and run the job in my Laguna IQ HHC."